Hudson Made Cedar Clove Beard and Shave Soap generates a lather that acts as both a gentle beard shampoo and an exceptional shaving cream. The exclusive formula rinses away debris while leaving behind the natural oils of your beard and skin. Those who shave will get a fine finish and smooth jawline with this soap's extraordinary slip. 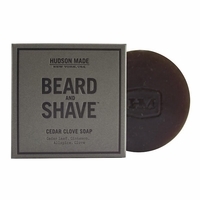 The woody spice of Cedar Clove Beard and Shave Soap, derived from cedar leaf, cinnamon, allspice and clove, stimulates the skin and senses for an invigorating shave. - 3.5 oz. Hudson Made soaps are small batch artisanal products created in the western Adirondacks of New York with locally-sourced organic ingredients whenever possible.